Many of you have seen and admired the butterflies I have been making. 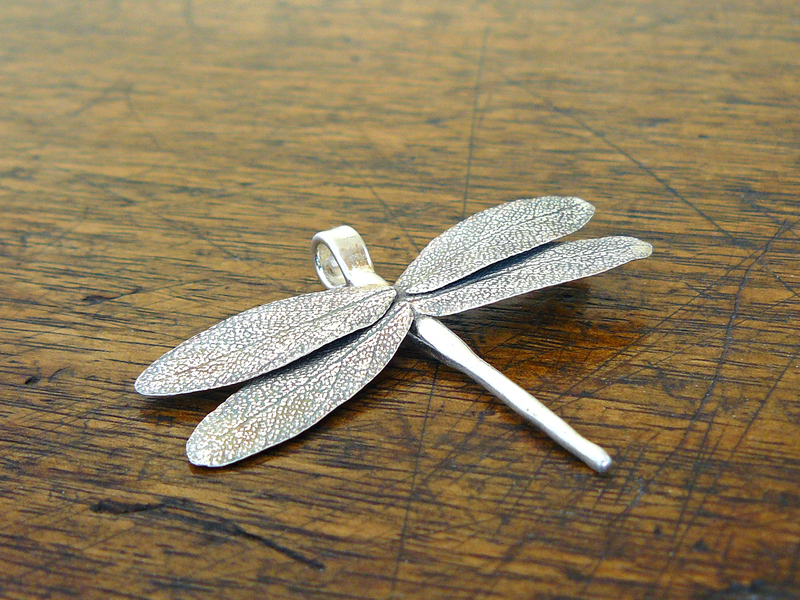 A customer wondered if I could make a dragonfly and certainly they are beautiful insects that capture our imagination. I have made three so far. The photo above is the largest of the three. I am very pleased with the result. This is a super busy time for me what with my son being home for the summer and art fair season being in full swing. I have made so many pieces that have sold before I had a moment to photograph them! I took a few shots this morning. 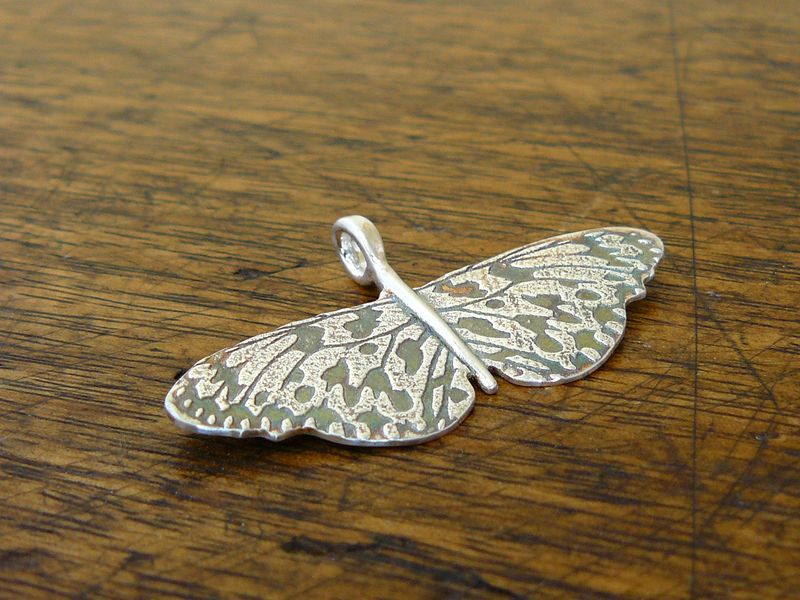 Below is another butterfly with a sleek body and head. I am working on ring number 4 for the ring a week flickr group. It is almost ready to take a little trip in the kiln. I truly think it will be a fantastic ring. It is made from silver clay and fine silver wire and will have a pearl set on top. More I will not say. Look forward to seeing it in a couple of days. I was pleased as punch with the way this weekend went. The gardens were such a beautiful setting for art, especially my botanical pieces. I received a special mention award from the jurors at the event. I was wowed. Meanwhile, I took a few shots of new items in the lovely diffuse natural light there. The necklace in this photo has an iridescent, multicolor patina that somehow looks more simple and monotone in this shot. I still have so much to learn about photographing jewelry. 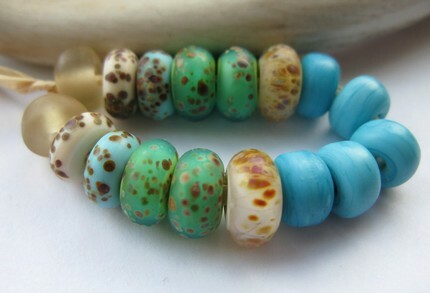 I just received these Ellen Dooley beads yesterday. I absolutely adore them, they are all hand made by her and perfect colors for summer. Hopefully I can combine them with some of my silver clay jewelry really soon. If not, they will work quite well with both copper and bronze as I move forward with those metals. I found out about Ellen because another metal clay artist mentioned her beads. She has a shop on etsy. 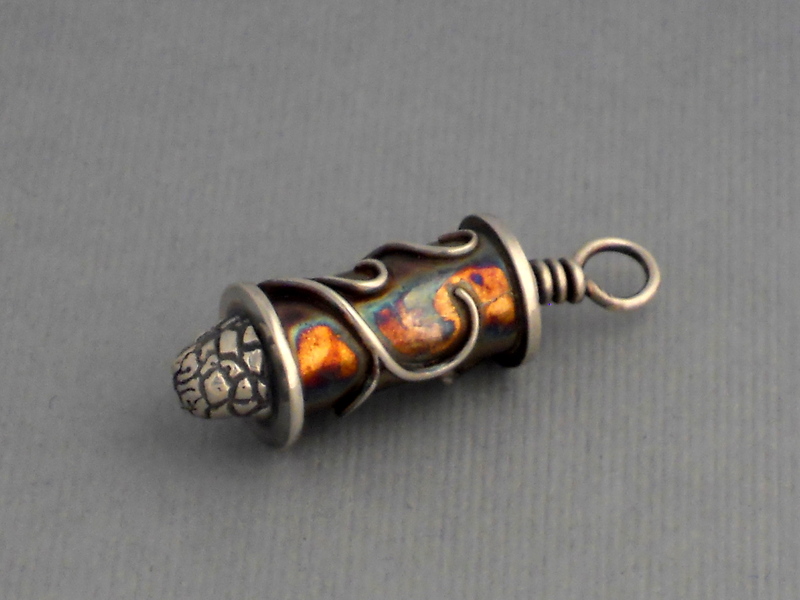 Check out the irridescent patina on this pendant. The whole background of the pendant has oil slick like colors. It has to be seen in person to be fully comprehended. 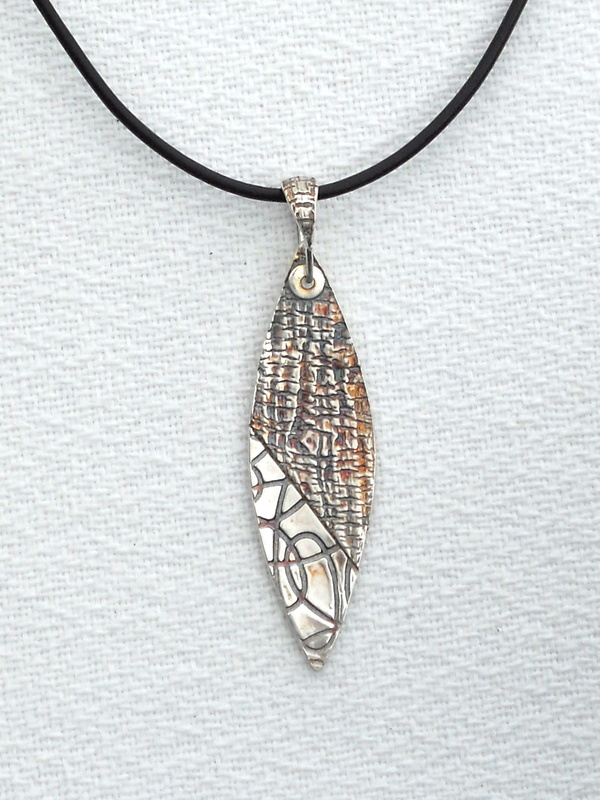 This item is entitled amulet for personal growth. The vines growing up the sides signify growth, the lower end has an earthy texture. More photos to come later today! Peoria Heights Art Fair this Saturday! I am all a flurry getting ready for the Peoria Heights Art Fair which is coming up this Saturday at Tower Park. I am madly finishing up lots of items and beginning a group of viking knit bracelets right now. I made a group of these last summer and since they were quite popular so it’s time for more. Also, the viking knit is more portable than my other process which makes it amenable to squeezing in a little jewelry making outside. No time to waste now! Saturday is rushing forward at break neck pace. Hope to see you at Tower Park! I spent a little time playing with the new camera we just bought. 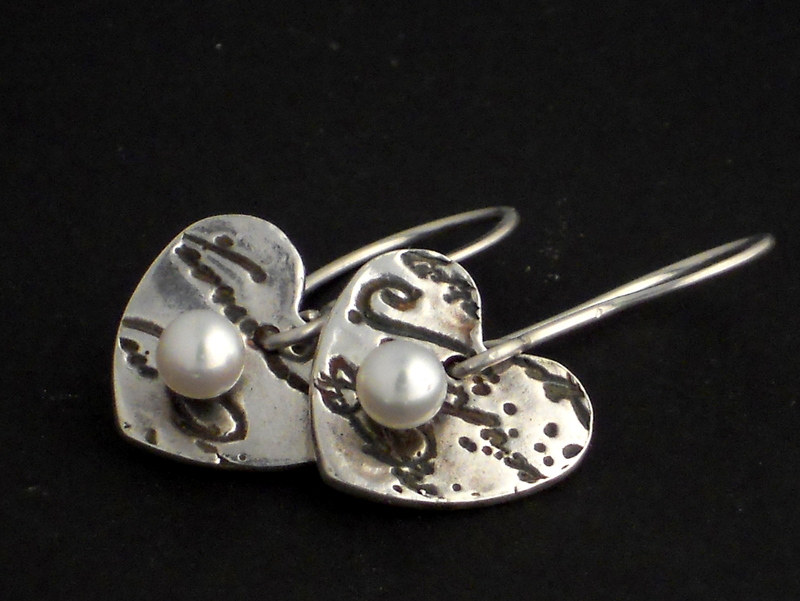 I took this terrific shot of a pair of earrings I made for a client who purchased a similar necklace. The new camera is a huge improvement over the old one in just about every way. It takes much better photos, it boots up in a flash, it has an amazingly easy set of menus that you can navigate with a stylus or your finger on the touch screen you also use to view with during picture taking. I am in love with this little camera!